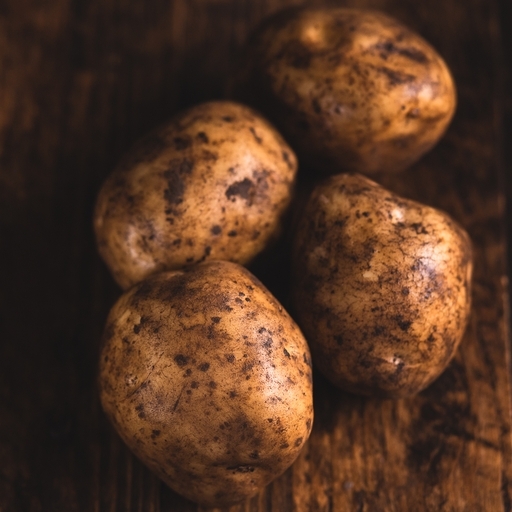 We grow our organic baking potatoes slowly and choose the best varieties for flavour. The variety changes every week, so you get to enjoy the full range of seasonal treats. They all bake beautifully, giving fluffy insides and crunchy skins. Pass the butter! Rub the skins with a little olive oil and sea salt for a really crunchy finish, then bake at 220?C/Gas 7 for 1-1 ? hours, depending on size. Good fillings include Bolognese, grated cheese and cooked greens, pesto and sour cream, or that old standby, baked beans. Keep baking varieties in a paper bag somewhere cool and dark. The potato season begins with new and salad potatoes in early summer. These are best for boiling and salads, then the main crop varieties, for baking, mash and roasting, begin in September. Floury varieties for baking are King Edward, Cosmos, Desiree and Sante. Good all-rounders are Marfona, Robinta, Ostara, Romano, Orla, Valor, Estima and Maris Piper. We grow potatoes on our Riverford farms. Our early varieties do well on coastal fields, where the maritime influence protects them from frosts.